Today I wanted to share another piece of Indiana folklore: the chain on the tombstone. In Bonds Chapel Cemetery (Orange County, Indiana) sits a gravestone that reads “Floyd E. Pruett, 1894-1920.” On the side of the stone is the ghostly appearance of a chain. Many argue the chain developed over time and the number of links continue to grow in number. The chain has been the topic of speculation for quite some time. Folklore scholar William M. Clements interviewed Terry, an “expert” on this tombstone, in 1968. Terry explained the tombstone’s unusual appearance. A chain, huh? According to S.E. Schlosser (Spooky Indiana, 2012), legend says Pruett died by a cursed chain. He had killed his wife with a logger chain (he was a logger) and, before her dying breathe, she put a curse on her husband. A few days later, a chain broke loose from a timber wagon, whipped in the air, and snapped the man’s neck. Some legends say it was the same chain he used to kills his wife. If you touch the chain today, you will be killed by a chain. This is just one of many versions of the story, though. He was killed in battle, and his girlfriend stood across the road, watching his burial from afar. Some say her ghost to this day still awaits his return. The chain is said to grow [edited from groe] one link longer every year, symbolizing her growing love for him, and it is said to glow at night. An apparition in a black dress can be seen standing on the other side of the road. But, Clements interviewed a grocer who remembered Pruett died from tuberculosis, and that the mysterious chain was probably the result of a rusty chain that had come in contact with the stone in the quarry. Another informant gave a similar explanation for the chain mark and Pruett’s death. Clements concluded that “a legend has been created among the youth of several southern Indiana counties in order to explain a physical phenomenon as well as to provide a supernatural ‘thrill’ as an escape from boredom” (264). Pruett most definitely died of usual circumstances and was unfortunately given an unusual gravestone. How did the story start? I don’t know. It is interesting to see the various explanations for the chain, from the believable to the wild. But, let us remember to see past the legend and acknowledge he is a person. Want to hear more locals (of the past) tell their version of the story? Read more here. Update. There’s a similar story about a Carl Pruitt in Kentucky. Same last name but different spelling. Weird right? Not haunted, but a girl can dream. In elementary school, our music teacher played a 1980s PBS cartoon set to Camille Saint-Saëns’ “Danse Macabre” on Halloween. The cartoon began with a statue of a cloaked skeleton coming to life after sunset, using his instrument to summon skeletons from their graves. Since then, I have always imagined the statues I see in cemeteries becoming animated at nightfall. In an article about haunted objects in Collectors Weekly. Michael Shermer of the Skeptics Society said, “[…] anytime you have a human figure, people are likely to think it holds some kind of invisible force, because of our propensity to believe in the afterlife and that humans carry a soul.” What better place than a cemetery, then, for stories about statues coming to life? They are so close to death, bodies, and souls. The following are cemetery statues believed to exhibit characteristics of the living: moving, bleeding, crying. Some of these statues are also a gateway to the afterlife, having the power to predict or even cause death. 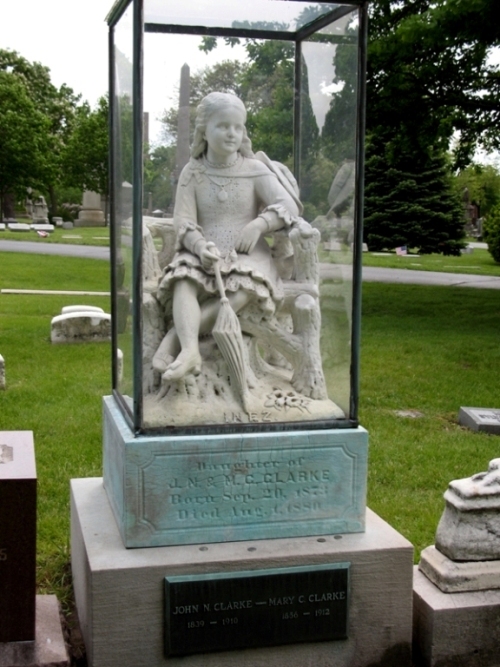 In Graceland Cemetery stands a memorial with the statue of a young girl behind protective glass. Legend says this young girl, Inez Clarke, was struck by lightening in the 1800s. On stormy nights in the cemetery, the statue is said to disappear (hiding from fear? ), leaving an empty glass case. She then reappears in the morning. There’s an excellent detailed description on Find A Grave (also to be credited for the image). The Eternal Silence statue (aka “The Statue of Death”) in Graceland Cemetery is, on its very own, very eerie and spooky. The statue memorializes Dexter Graves, who in 1831 led 13 families from Ohio to, what would become, Chicago. 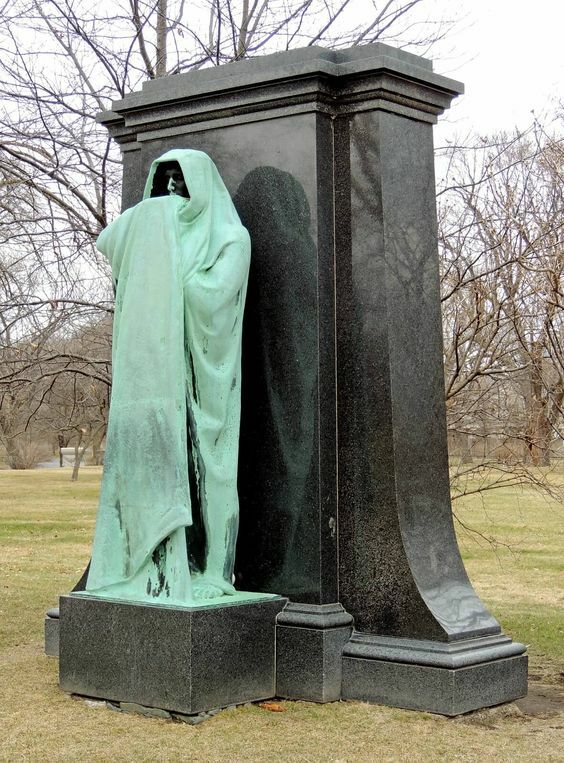 The hooded bronze statue, a version of the Grim Reaper, was designed by Lorado Taft. Supposedly, if you stare into the eyes of Eternal Silence, you will see a vision of your own death. There have also been many reports of the statue raising and lowering its uplifted arm. Further, the statue (up until the 1970s) could not be photographed, “stemming from amateur photographers reporting malfunctioning of normally cooperative cameras, or inexplicable destruction of camera film” (Atlas Obscura). This statue, named “The Angel of Death Victorious,” is a life-sized bronze statue of a seated angel. She holds a extinguished torch upside down, which represents a finished life. Some visitors believe that the statue is crying black tears, but could it just be the effects of aged bronze? I discussed a haunted mausoleum in this very cemetery in an earlier post. According to urban legend, this cemetery is a gateway to hell. One day when the mausoleum/receiving tomb was opened, it was revealed that the bodies were missing. So, already a creepy place. The cemetery also has a headless angel statue with a bleeding neck. One popular theory is that the blood is just moss. Moss is boring though. Let’s go with blood. The Black Aggie is a name given to a statue that once resided on the memorial of General Felix Agnus in Druid Ridge Cemetery. The statue was moved because of damage caused by visitors, and eventually ended up in a courtyard behind the Dolley Madison House in Washington, D.C. When Black Aggie lived in Druid Ridge Cemetery, there were many scary stories attached to it. According to legend, the dead of Druid Ridge would gather around the statue at night. The statue was also believed to cause blindness and miscarriages (Source). What had been a funny initiation rite suddenly took on an air of danger. One of the fraternity brothers stepped forward in alarm to call out to the initiate. As he did, the statue above the boy stirred ominously. The two fraternity brothers froze in shock as the shrouded head turned toward the new candidate. They saw the gleam of glowing red eyes beneath the concealing hood as the statue’s arms reached out toward the cowering boy. With shouts of alarm, the fraternity brothers leapt forward to rescue the new initiate. But it was too late. The initiate gave one horrified yell, and then his body disappeared into the embrace of the dark angel. The fraternity brothers skidded to a halt as the statue thoughtfully rested its glowing eyes upon them. With gasps of terror, the boys fled from the cemetery before the statue could grab them too. Hearing the screams, a night watchman hurried to the Agnus plot. To his chagrin, he discovered the body of a young man lying at the foot of the statue. The young man had apparently died of fright. In Oakland Cemetery stands a 8.5-foot bronze statue of the Angel of Death, which was erected in 1913 and marks the grave of Teresa Feldevert. Like the Black Aggie, there are many thrill-seeking games involving the eerie statue. On Halloween, young people dare their friends to touch or kiss the statue. Touching or kissing the statue, rumor has it, will strike you dead (unless you are a virgin). And, like Black Aggie, this statue allegedly causes miscarriages. Behind a private iron fence sits the grave of Gracie Watson marked by a statue of Gracie sitting on a tree stump. In 1889, Gracie (age 6) died of pneumonia, leaving behind her grief-stricken parents. Her spirit still lingers in her parents’ hotel. Hotel staff have reported Gracie’s disembodied voice in the back stairwell, a place she once hid in during her parents’ parties. Many visitors to Gracie’s memorial leave small toys and gifts. It is said that if you remove gifts from the site, she will cry tears of blood. Visitors to the cemetery have also reported seeing a young girl in a white dress skipping through the property, only to vanish into thin air. My current obsession is looking up photographs of cats in cemeteries, a marriage of my two obsessions. I am not sure what happens after death, but I like the idea of cats hanging out near my grave (maybe even howe sitting on it). As I have explored in a past post, cats are associated with death and the supernatural, so cats and cemeteries are not an unlikely pair. Why are there so many photographs of cats in cemeteries? Are they trying to steal corpses? Comfort mourners? Sun bathe and chill? In the following post, I recreate a entry from my commonplace book on this topic. So, it is a collection of sometimes unrelated pieces (texts and images) rather than a linear narrative. Kasha: In Japanese folklore, Kasha is a monster cat that steals corpses out of their coffins. “Kasha are occasionally employed as messengers or servants of hell, in which case they are tasked with collecting corpses of wicked humans and spiriting them off to hell for punishment. Other times, they steal corpses for their own uses — either to animate as puppets or to eat” (Yokai.com). They live among humans as average cats, but can grow into sizes larger than humans and are sometimes accompanied by fire. At St. Sampson’s Parish Cemetery on the island of Guersney (off the coast of England), Barney the Cat roamed the cemetery for 20 years and comforted mourning visitors. When he passed in 2016, he was buried in a special place and memorialized with a plaque and bench in the cemetery. Many took to social media to share their personal stories about Barney. More info (and stories): Buzzfeed. Happy Halloween! I cannot give you candy via the internet, but I can give you 31 ghosts. Hope you don’t run into any evil spirits while celebrating. Stay safe, folks! Petni/Shakchunni (Bengali folklore): Female spirits that died unmarried and want marriage in the afterlife. They may possess rich women to fulfill this desire. Imori (Japanese folklore): The ghosts of warriors that have been transformed into geckos. They hide in ruins and attack tresspassers. Vântoase (Romanian folklore): Female ghosts living in the forest with the ability to control the wind, causing dust storms. They also attack children. Penchapechi (Bengali folklore): A ghost in the form of an owl that follows lost travelers until they are alone and vulnerable. Then, he strikes and consumes the traveler. White Lady (appears in many cultures): A female ghost often linked to tragedy or betrayal (by a lover). Here’s a long list by location. Zashiki Warashi (Japanese folklore): House spirits that appear as 5-year-olds or 6-year-olds wearing traditional clothes. They cause mischief around the house, but bring its inhabitants luck. El Silbon (Venezuelan folklore): The ghost of a male spirit that killed his father (one legend says it was because his father came back empty from a hunt). He attacks drunk men on their way home, drinking the alcohol out of their stomachs through their belly buttons. He is known for his whistling. The Knights of Alleberg (Swedish folklore): The ghosts of 12 soldiers that died during the Battle of Alleberg (1389). They are trapped inside a mountain, waiting for a new war. Legend says if they fight in this new war and save their country, they will finally go to Heaven. Shui Gui (Chinese folklore): The spirits of people who have drowned and inhabit the water where it happened. They drag victims into the water so to possess them. Screaming Skulls (English folklore): Screaming skulls are ghosts in/attached to human skulls that haunt a location, most commonly places in England. Most often, these spirits seem to be attached to their homes and will exhibit poltergeist or ghostly behavior when removed. Read more on this past blog post. Ridgeway Ghost (Wisconsin folklore): This ghost of two combined spirits of brothers who died in a bar fight in the 1840s. The ghost appears in many forms: headless horseman, man carrying a whip, domestic animals, a young woman, or an old woman. The ghost haunts a along a 25-mile stretch of road in Wisconsin. Jack-In-Irons (English folklore): A ghost that haunts the roads of Yorkshire, England. He is covered in chains (which is actually a less common image in folklore than pop culture might suggest). He jumps out into the road and scares travelers. Faceless Gray Man of Pawleys Island (South Carolina folkore): The gray apparition of a faceless man that appears before hurricanes. He was last seen before Hurricane Matthew in 2016, allegedly. The Black Dog of Newgate Prison (English Folklore): A black dog appeared before executions at this past London prison for over 400 years. According to legend, a scholar was brought to this jail in 1596 on allegations of witchcraft. Before given a fair trial, he was killed and eaten by starving prisoners. Shortly after the dog appeared. Greenbriar Ghost (West Virginia folklore): The ghost of Elva Zona Heaster Shue led her mother to evidence proving her husband killed her, which was later used during the trial. Read the fascinating story on mental_floss. Aka Manto (Japanese urban legend): A spirit that haunts public bathrooms and asks visitors if they want red or blue toilet paper. If you choose red: you will be cut until you clothes are stained red. If you choose blue: you will be chocked until your face turns blue. Nishi (Bengali folklore): A nocturnal spirit that lures victims into secluded areas with the familiar voice of a loved one. The victims disappear and no one knows what happens to them. “Philip”: an artificial ghost created during a 1972 parapsychology experiment. Read the story on this past blog post. Radiant Boys (English and German Folklore): The spirits of boys that were murdered by their mothers. The sight of a radiant boy foretells bad luck or death. Vetala (Indian folklore): A spirit that haunts cemeteries and inhabits corpses. They also love to play tricks. Wild Hunt (European folklore): A spectral hunting party that appears at night. If you see this spectral procession, you may be transported to a foreign land or the underworld. Or, you may die. Demon Cat (American folklore): A large spectral black cat that haunts the basement tunnels of Washington, DC government buildings. It’s appears before elections and national tragedies. Read more on this past blog post. Kyokotsu (Japanese folklore): Skeletal spirits that pop out of wells to scare people. These are the spirits of people who died after falling in a well or had their remains thrown into one. 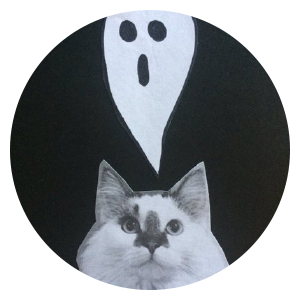 Mechho Bhoot (Bengali folklore): A ghost who loves fish. He lives near ponds and lakes, urging nighttime fisherman to give him fish. If they refuse, he may threaten harm. He also likes to steal fish from kitchens. Diao si gui (Chinese folklore): Spirits of those who died from hanging (murder, suicide, execution). Kerakera onna (Japanese folklore): The ghost of an enormous, middle-aged woman dressed in a brightly colored robe and covered with make-up. She appears in the the alleys of the red-light district and scares men with her crackling laugh. The old Peoria State Hospital in Bartonville, Illinois is home to a ghost named “Old Book.” Old Book (1878 – 1910) was a popular patient at the hospital, who served as the hospital’s gravedigger during his time there. After the burial services of each patient, it is said that Old Book leaned against an old elm tree and cried for the deceased. When he died, hundreds of patients, doctors, and staff members came to the funeral. When staff members were lowering his casket, they commented that it felt empty. Suddenly, a crying sound came from the old elm tree, making the funeral guests turn and look. Many claimed to see Old Book, leaning against the tree. They checked the casket to make sure he was indeed there, and when they went to open the lid…the crying stopped. He was still in his coffin. After the funeral, the elm tree began to die. Several groundskeepers tried to remove the dead tree with no luck. Eventually, the tree was struck by lightning and removed. Church Grim (Swedish and Finnish Folklore): The Church (or Kirk) Grim is attached to a particular church and oversees the welfare of the churchyard. They might also appear in forms of other animals, though dog is most common. They are the spirits of those first buried in a church’s cemetery. Oftentimes a dog was sacrificed and buried when building a new church and accompanying cemetery, so that he could serve as a Grim in the afterlife (intsead a human soul). And of course…Jack-o’-Lantern. 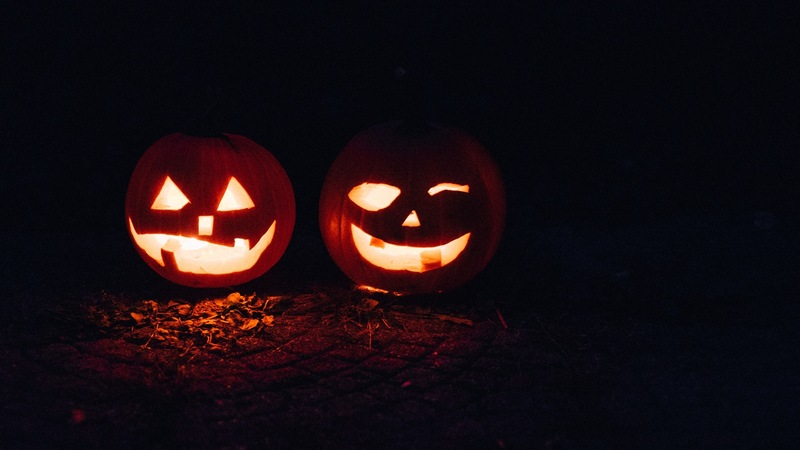 Read the ghostly origins of this Halloween tradition on mental_floss. Although it’s always spooky on Notebook of Ghosts, I thought I might share some links on history specific to Halloween. I looked through my favorite websites and created a short list for Halloween Weekend reading. Enjoy! And if you haven’t yet, check out my post on the Lost Halloween Traditions for Summoning Future Lovers. Halloween is the time of year when the veil between life and death becomes thinner, but so does the one between present and future. Many lost Halloween traditions involve girls and young women foretelling your future partner through unique rituals. You don’t need a crystal ball to see your future lover, just some autumn food, some household essentials, or maybe some comfortable walking shoes. Eat an apple and comb your hair in front of a mirror at midnight on Halloween. Your future husband’s image will appear over your left shoulder. Have women mark apples and then place them in a tub of water. Then have men bob for apples to see future love matches. Peel one long strand of an apple skin and throw it over your left shoulder. The first initial of your future partner’s name may be revealed. Or take that apple peel, nail it above your front door, and the first person to walk under it will have the same initials of your future lover. Make a fire and have all your unmarried friends tie apples to strings. The order in which the apples fall off the string is the order everyone will get married. The owner of the last apple dropped will never marry. Go to bed with an apple under your pillow and you may dream of your future spouse. Grab some hazelnuts and designate each one for a love interest. Throw them into a fire. The hazelnut that burns to ash, instead of popping, is your future partner (Scottish tradition). Eat some salted herring before bed. It will cause a thirst that will hopefully summon the sympathetic spirit of your future partner (with a glass of water of course). Blindfold yourself and pull a cabbage out of the ground. Examine the root with your hands to collect clues for your future spouse. Make Colcannon (a traditional Irish dish made with kale, mashed potatoes, and onions) and hide a ring in it. The person that finds the ring is getting married within the year. Sprinkle letters cut out of a newspaper into water to see your future lover’s name. Get three bowls. Fill one with clean water, fill another with foul water, and leave the last one empty. Blindfold a friend and have them pick a bowl. If the bowl with clean water is picked: your future partner will be attractive. The foul water: your partner will already have been married before. Empty: You will die alone. Hold a candle in front of a mirror in a dark room (sometimes after having walked up/down stairs backwards) and your future lover will appear. Eat a sugary dessert made of walnuts, hazelnuts, and nutmeg before bed. Your future lover will appear in your dreams (Scottish Tradition). Find a stream at a point where the land belonging to three people meet (easy right?). Stick your sleeve in the stream. Go home and hang your shirt/dress over the fire. That night your lover will appear and turn over the sleeve to allow the other side to dry. Take your friends outside for a hazelnut hunt. The first person to find a burr is the first person to marry. What is a Ghost Light? Ghost Light: a mysterious ball (or irregular shape) of light with no natural explanation that often appears at night in remote locations. Ghost lights usually come in yellow or white, but can be red, blue, or orange. They appear in remote areas. They are elusive and can be seen from different angles and distances. They react to noise or light by receding or disappearing. They are accompanied by hummings, buzzings, or outbreaks of gaseous material. They are associated with folklore surrounding a haunting because of an accident or tragedy (for example the light represents the lantern used by a ghost searching for his decapitated head). There are several examples of ghost lights in folklore. Aarnivalkea (Finish folklore): a light that appears over the location of buried faerie gold. Aleya (West Bengal & Bangladesh): A ghost light that appears over marshes that causes fishermen to lose their bearings, sometimes leading to drownings. Hitodama (Japan): “Hitodama are the visible souls of humans which have detached from their host bodies. They appear as red, orange, or blue-white orbs, and the float about slowly not too far from the ground […] On warm summer nights, these strange glowing orbs can be seen floating around graveyards, funeral parlors, or the houses where people have recently died. Most often they are only seen just before or just after the moment of death, when the soul leaves the body to return to the ether” (Yokai.com). Onibi (Japan): “One of the more dangerous types of hi no tama yokai, onibi is a beautiful but deadly phenomenon. Its name means ‘demon fire,’ and it certainly earns that moniker. It look likes a small ball of flame, usually blue or blue-white (red and yellow onibi are less common), and often appears in small groups of twenty to thirty orbs. The orbs can range in size from three to thirty centimeters, and usually float around at eye-level. They appear most often during the spring and summer months, and particularly on rainy days. They appear more frequently in places that are surrounded by nature” (Yokai.com). Will-o’-the-wisp (English and European folklore): “or ignis fatuus (/ˌɪɡnᵻs ˈfætʃuːəs/; Medieval Latin: ‘foolish fire’) is an atmospheric ghost light seen by travellers at night, especially over bogs, swamps or marshes. It resembles a flickering lamp and is said to recede if approached, drawing travellers from the safe paths. The phenomenon is known by a variety of names, including jack-o’-lantern, friar’s lantern, hinkypunk, and hobby lantern […]” (Wikipedia). So many other interesting folklore examples of ghost lights from all over the world can be found here. Click here for famous ghost lights seen all over the world. What About That Other Ghost Light? These ghost lights are not to be confused with the ghost lights in theatre. Ghost Light can also refer to the single illuminated light left onstage in a theatre after everyone has gone home. There are two reasons for this light. The first reason is more practical: to provide light in a dark theatre so no one falls into the orchestra pit. The second reason is more paranormal. It is believed that every threatre has a ghost. The ghost light keeps the ghost from being mischievous when everyone is away. You can learn more here: “The Story Behind the Ritual that Still Haunts Broadway,” Atlas Obscura. I was obsessed with Alvin Schwartz’s In a Dark, Dark Room and Other Scary Stories when I was a child. I checked it out from the school library as often as I could, and I always turned to the short story, “The Green Ribbon.” The stories in this book are inspired by folklore, and with folklore comes different versions of a story. I have heard versions with a yellow ribbon. I had mentioned this story on Facebook yesterday and Kira Butler said she heard versions with a black or blue ribbon. Whatever color ribbon you prefer, the frightening twist at the end always stays the same. Today, I’m sharing a version with a yellow ribbon as retold by S.E. Schlosser, author of Spooky Wisconsin. Enjoy! Jane wore a yellow ribbon around her neck everyday. And I mean everyday, rain or shine, whether it matched her outfit or not. It annoyed her best friend Johnny after awhile. He was her next door neighbor and had known Jane since she was three. When he was young, he had barely noticed the yellow ribbon, but now they were in high school together, it bothered him. “Why do you wear that yellow ribbon around your neck, Jane?” he’d ask her every day. But she wouldn’t tell him. Still, in spite of this aggravation, Johnny thought she was cute. He asked her to the soda shoppe for an ice cream sundae. Then he asked her to watch him play in the football game. Then he started seeing her home. And come the spring, he asked her to the dance. Jane always said yes when he asked her out. And she always wore a yellow dress to match the ribbon around her neck. It finally occurred to Johnny that he and Jane were going steady, and he still didn’t know why she wore the yellow ribbon around her neck. So he asked her about it yet again, and yet again she did not tell him. “Maybe someday I’ll tell you about it,” she’d reply. Someday! That answer annoyed Johnny, but he shrugged it off, because Jane was so cute and fun to be with. Well, time flew past, as it has a habit of doing, and one day Johnny proposed to Jane and was accepted. They planned a big wedding, and Jane hinted that she might tell him about the yellow ribbon around her neck on their wedding day. But somehow, what with the preparations and his beautiful bride, and the lovely reception, Johnny never got around to asking Jane about it. And when he did remember, she got a bit teary-eyed, and said: “We are so happy together, what difference does it make?” And Johnny decided she was right. With shaking hands, Johnny fumbled for the knot and untied the yellow ribbon around his wife’s neck. And Jane’s head fell off. Misunderstood people are sometimes feared to the point of folklore legacy. We cling to myth to avoid confronting the other, creating monsters that aren’t really there. So much of my own childhood lore was attached to that neighbor that seemed “off.” For example, “Old Man Bill,” that lived down the street of my childhood home, was rumored to have chased dogs and children out of his yard with a butcher knife. I could, like Kevin McCallister, approach this eccentric man and dig deep into his own personal loss. But, I was always told to stay away from strangers and the alleged tales of his violence helped in doing so. But then there were the games. “I dare you to run to Old Man Bill’s yard and stick your toe in the grass.” “No…I dare you to knock on his door.” No one wanted those games to end and we looked forward to taunting younger children with the same tale and dares. When do these tales go to far? When do these dares become harassment? How do our fears rewrite history? Where does fact end and fiction begin? Growing up in the Indianapolis area, the story of The House of Blue Lights was an important part of my paranormal history. The story begins with the tragic death of a millionaire’s wife. While the versions of the story differ from one storyteller to the next, I was told he kept her in a glass coffin in his mansion, surrounding her with blue (her favorite color) Christmas lights. Some legends say the lights were around the pool and other areas of his property. Some say you can see a woman walking the property at night, catching glimpses of her in one of the blue lights (the USC Digital Folklore Archives interviewed someone about this very story). This man behind the blue lights was Skiles Edward Test. Skiles grew up, along with brother Donald and sister Dorothy, in the mansion their father Charles built at 795 Middle Drive in Woodruff Place on the near east side. The mansion still sits on a giant lot, its heavily wooded garden obscuring the carriage house set back from the street. Nearby Arsenal Technical High School wouldn’t open until 1912, so young Skiles attended Manual Training High School, located at 525 South Meridian before it was relocated to Madison Avenue in 1953. Skiles was a permanent fixture on the Honor Roll and finished in 3 1/2 years, graduating in 1908. If he had intended on going to college, he never got an opportunity. Charles Test passed away in a Wisconsin sanitarium of Bright’s Disease in 1910, leaving the eldest child, Skiles, to head the family. In 1913, Skiles and his new wife, Josephine Benges, moved onto a large wooded and secluded property. His property was remarkable and had a full farm, large pool, small rail system, and it’s own working power plant. He definitely found interesting ways to spend his inheritance, but made sure to share it with his family and community. The Skiles estate included two complete power plants and a cat and dog cemetery with headstones. Mr. Test loved animals and refused to turn away strays. At one time he reportedly had 150 cats and 15 St. Bernard dogs on his estate. After his death, albums of photographs of dogs, cats, squirrels and other animals lying in state in small caskets were found among his possessions. In spite of his reputation for eccentricity, Mr. Test was a friendly and generous man who supported many charities. He donated a large tract of land to the Lawrence Township School District that is now the site of Skiles Test Elementary School and a nearby nature preserve. A large portrait of Mr. Test is displayed in the lobby of the school. He also, along with his siblings, constructed a building on the Monument Circle of downtown Indianapolis in his father’s honor (complete with Indianapolis’s first parking garage). Throughout the Fifties and into the Sixties, the trespassers and vandals became increasingly bold. Skiles found a group of teens swimming in his pool and took their clothes and keys, only to be sued by one boy’s father. Trespassers released dogs from their pens and started fires in outbuildings. Skiles found a teen in his kitchen drinking a Coke he’d taken from the fridge. For a while, he took to sleeping in the multi-story pool house, its cinder-block construction being more fire-proof than the house. Plagued with stress-related ulcers, Skiles began to leave each night and stayed at his girlfriend’s house, so as to not be tormented by the nonstop onslaught of lookie-loos. It seemed that the stories of trespassing became lore. I once heard that a trespasser put one of Skiles’s cats in a cage with an aggressive dog. The House of Blue Lights is a reminder that we must enjoy the tales we hear, but with a critical mind. We can become the “monster” if we get too caught up in the mystery, missing the opportunity to learn the other’s truth and wisdom. The property and surrounding structures have been torn down since, but some still report flickering blue lights. I like to think that its just Skiles messing with us. For more information, you might check out houseofbluelights.com. Also, Skiles is buried in Crown Hill Cemetery, a place I visited in a past post.